The dollar was trading lower today as traders switched back to riskier bets including the euro and the Pound. The Japanese yen was the exception. USD/JPY was trading up at 120.67 extending a five day rally. EUR/USD was testing resistance around the 1.13 area. EUR/USD found a floor around 1.1082 earlier in the week and has been rising steadily for the past four days. In the US jobless claims were in line with expectations. New filings for state unemployment fell to 275,000 last week figures released by the Department of Labor showed. This follows a positive report from the Federal Reserve yesterday underscoring the fact that the US labor market has strengthened over the past two months. Traders however turned to macroeconomic events. An easing of fears that China is heading for a hard landing has driven a sharp reversal of risk positioning. Chinese consumer prices rose in August by 0.5 percent according to the latest figures – beating the forecasts. However producer prices fell by more than expected. The annual producer price index fell by 5.9 percent in August, even worse than the 5.5 percent fall that was predicted. The data was worrying as it follows a trend of falling producer prices, suggesting that businesses are still struggling with overcapacity and sluggish demand. It also highlights the risks that China could experience a damaging period of deflation. Markets chose to look at the positive today however and were cheered by the broad set of policy measures that Chinese authorities have announced recently to head off a downturn in the economy. Currencies dependent on the commodities sector received a boost today following the improving outlook in China. The Australian dollar had its strongest one-day gain in three months. 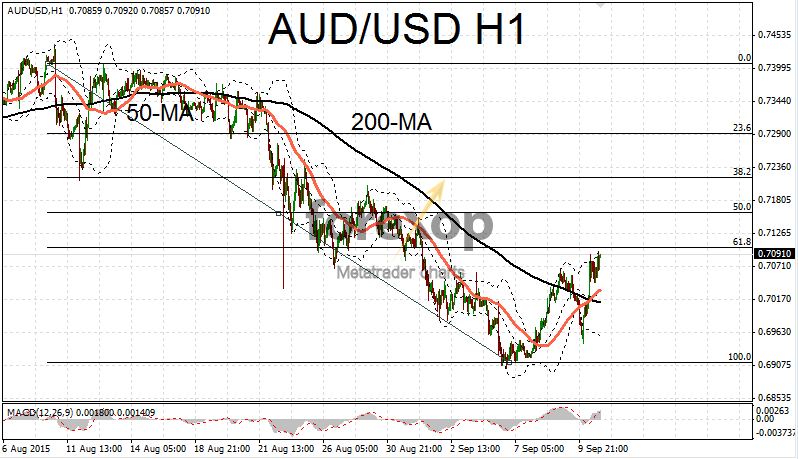 AUD/USD rallied nearly two percent to 0.7085. AUD/JPY performed even better with a move of more than two percent taking the pair to 85.47. The sharp turnaround in the Aussie came after some positive news on the country’s jobs market. Employment rose strongly in August. According to figures from the Australian Bureau of Statistics, employment rose by 17,400 in August. This was well ahead of the 5,000 new jobs that were expected. Traders welcomed the fact that non-mining sectors of the economy appear to be taking up the slack.